Blue Knight wrestlers lose to West Liberty U.
UU’s Cole Houser (pictured) earned his team-high 14th win by a score of 10-3 over WLU’s Josh Cornell. 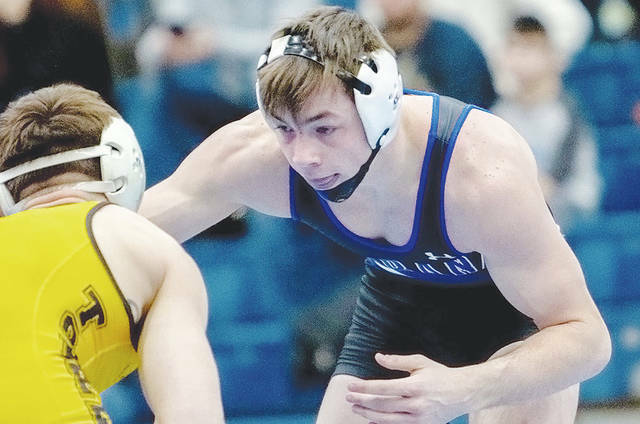 The Urbana University men’s wrestling team suffered a 38-10 setback against West Liberty at the Grimes Center. After trailing 16-0, UU claimed three consecutive victories to make the score 16-10 through six matches. Jake Lees got the Blue Knights on the board with a 10-2 major decision over WLU’s Miles Mazik at 149 pounds. Then, Cole Houser and Dylan Knotts recorded back-to-back decisions at 157 and 165 pounds, respectively. Houser earned his team-high 14th win by a score of 10-3 over WLU’s Josh Cornell. Knotts followed up with a 9-4 decision against WLU’s Jacob Ramsey. However, the Hilltoppers responded with three pins over the final four matches to move past the Blue Knights. UU rounds out the regular season at Tiffin on Saturday and at Lake Erie on Wednesday, Feb. 13.
https://www.urbanacitizen.com/wp-content/uploads/sites/36/2019/02/web1_houser.jpgUU’s Cole Houser (pictured) earned his team-high 14th win by a score of 10-3 over WLU’s Josh Cornell.